As I have been deep cleaning our belongings, as in going through every last piece of paper in the house and getting rid of ALL things broken/not used/not needed/doubles/, I have come across a lot of my writings from over the years. I posted a picture yesterday on my personal Facebook page of how to spot a true writer and it was a photo of a story I started on a torn piece of cardboard that I pulled out of a box of bills. It was always my dream to be a writer and I never realized I was doing it all along. It was something I did and tucked away inside my messy life. I also came across things I had written down about my future. Some of those things I am glad did not come to pass. Others are dreams I still hold on to. I’ve been reading and listening to the CD’s from a book/box set a friend gave me by Terri Savelle Foy called “Imagine Big.” She talks of imagining your life the way you want it and actively pursuing it. These are not new ideas to me but it certainly has put a fire under me. If you want to be better at football, you practice. If you want to be better at playing the piano, you practice. If you want to do anything better, you practice. As you practice, you improve. As you improve, you achieve. As you achieve, you create new goals. Get the picture? I want to live better. How do I do that? I practice. How do I practice? I dream. I write down the dream. I look at the dream. I pursue the dream. It’s not magic. It’s not witchcraft. It’s creating a goal, writing it down and pursuing it. Habakkuk 2:2 tells us to write the vision, pursue it and it will come to pass because of our faith. Faith is believing in things not yet seen. Faith is knowing without physical proof. You have to believe first then it will come to pass. You have to know that you know, that you know. With this box set my friend gave me is a workbook designed to write your dreams down. It allows room for a picture, a space to write the goal, a space to record the progress, a place to put the date you wrote it down and the date it came to pass. I’ve done this before. So, a week later, he sent me a picture. 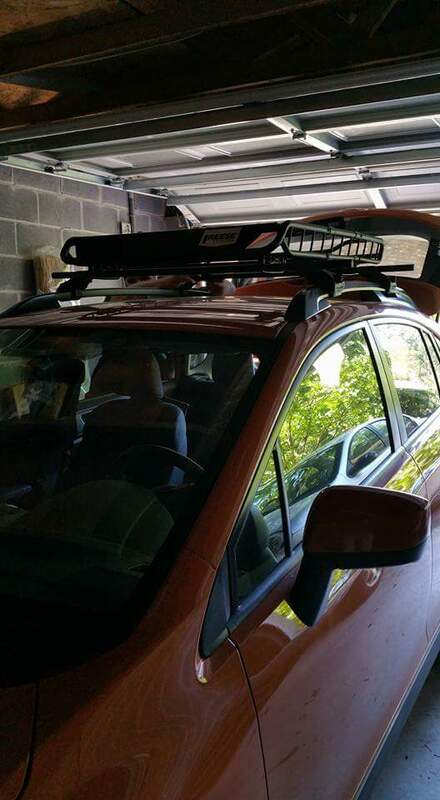 It was an orange Subaru Crosstrek and he said he wanted one with a rack on top. December 1, 2014 I printed that picture out, pasted it into the prayer book and wrote down the vision which included the means to pay for it. The second half of the vision that will come to pass this year. The first part of January 2015 we walked into the Subaru dealership and they didn’t have an orange Subaru Crosstrek. So what did we do? We ordered one! We ordered him his very own car. Subaru. Orange. Crosstrek. That car was built from the beginning, in the factory, with his name on it. It was manufactured and shipped across the seas with his name on it. It was stuck at port over off of California because of the strikes that were going on. Go ahead, google it. Port strikes March of 2015. It was supposed to be to him in six weeks which would have put it middle of February but because of the strike, his car didn’t show up until a month later in the middle of March once the strikes were over. You know what happened during that time? An increase in our income which allowed for the payments we would have on his car. A couple months after he got his car, I took a test drive in it and liked it so much, I went and got one! We found a rack a few months later at an excellent price for his car. I ended up trading in for a silver Crosstrek, the one that I really wanted. There’s an entirely other twist to that testimony to be shared later. Now we are believing to have both cars paid off by the end of the year to complete the prayer and vision I wrote down in 2014. With God, ALL things are possible. A month or so after we first purchased both cars. The new rack being installed! To us, believing God for a good running car with a great warranty seemed impossible at one point in our life but because we exercised (practiced) our faith, believed in His Word, put our faith in motion, we received. There was an earlier time in my life where believing God for $20 for gas seemed impossible. If we can believe God for a car (the impossible), what other impossible things can we believe God for? We have huge ministry dreams. Without exercising our faith in something small like a vehicle, how can we believe God for big things like a successful ministry that is much more important? If I showed you my prayer/dream book right now, you would laugh. You would tell me I’m crazy. You would not have the faith I have in those things coming to pass. I’m okay with that. I don’t need your faith, I just need mine and My God. I don’t say that to be facetious. I say that to show you that YOU can believe God for your hearts desires too. You don’t need someone else to believe for your dreams. You just need you and God. If you can get others to believe with you, great! If not, keep on keeping on! Eventually others will get on board. We have to read His Word to know His will. I’ve yet to read anything in His Word that denies me anything. Repeat that. I’ve yet to read anything in the Word that denies me anything. His promises are yes and Amen. His Word is freedom. His Word is Truth. If I have a right heart, my needs and wants will line up with the Word so ask and I’ll receive. I know too many Christians who struggle with this and refuse this even though it says it right in the Word! I already know some would look at this and say we asked for material things, how dare we! Well, material things are at the very bottom of God’s list. If we can be faithful in our money, He can entrust us with more. Until we change our thinking about finances, we will continue to struggle. God provides, my money doesn’t provide. If he feeds and shelters the birds how much more will he take care of me? That’s an entirely different topic I’ll save for another day. I know too many Christians who say “Well, if it be God’s will…” and they say it because they have no idea what His will is! I know what my God wants for me. He wants me healthy and whole. I said basically the same thing in my post yesterday but evidently someone needs this today. He wants me full of joy. He wants me prosperous. He wants me rejoicing, praising and worshipping Him because it gets my eyes off my problems and brings revelation and freedom from the things that try to hold me back! He doesn’t just want this for me, He’s your Father too and He is no respecter of persons. That means He wants this for ALL. My husband and I are believing God for big things. Each morning we pray together before we eat. As we eat breakfast, I read aloud from a daily devotional. I created a secret board on Pinterest (had no idea you could do that until this week) and I have saved images representing those things we are believing for. This morning, we scrolled through those images together. We have our dreams and goals written down in a notebook as well. We are exercising our faith. We are putting to use what God gave us: His instruction, His Word, His promises. We are excited about our God given dreams. We are speaking them out. We are focusing on them. We are watching them take shape and form and tending to them. Your doubt, your fears, your negative talk and unbelief stops God from fulfilling your dreams. You can’t say you are going to be a star basketball player then sit on the sidelines, do nothing and talk about what a terrible basketball player you are. It will never work that way. Neither does faith. Exercise your faith! Practice your faith! And the Lord answered me, and said, Write the vision, and make it plain upon tables, that he may run that readeth it. For the vision is yet for an appointed time, but at the end it shall speak, and not lie: though it tarry, wait for it; because it will surely come, it will not tarry. Behold, his soul which is lifted up is not upright in him: but the just shall live by his faith. I absolutely stand in agreement with you! I had a similar God movement with an automobile. I’m like your husband where this is concerned but I had my eyes set on a particular SUV because mine was dying a slow death. I finally literally told Him to pick out the vehicle he had for me and he did. Then just a week later my income increased to cover the payment and still have plenty to save monthly. This wasn’t the first instance where God provided in a big way. It boild down to trusting him for everything! Blind faith! Thanks for sharing and encouraging! Keep walking by faith and not by sight. Misty, Love, love, love this! Some might criticize and say God is not a “name it and claim it, God.” I just want to say, I don’t think that’s what you’re conveying and neither am I. I know from the truth of God’s word that He wants to bless His children. It might not always look the way we expect, but His ways are ALWAYS GOOD BECAUSE HE IS ALWAYS GOOD. You say it so well, “I know what my God wants for me. He wants me healthy and whole. I said basically the same thing in my post yesterday but evidently someone needs this today. He wants me full of joy. He wants me prosperous. He wants me rejoicing, praising and worshipping Him because it gets my eyes off my problems and brings revelation and freedom from the things that try to hold me back! Thanks for sharing your personal journal. And good luck cleaning out things. Ugh, I probably need to be doing that too. Exactly! When material things seem like a mountain, that’s what we will focus on. It isn’t until we recognize the insignificance of material items that we can recognize the significance of spiritual things. In other words, if I can’t believe God for a vehicle, how can I believe and trust Him with an entire ministry? The ministry is the more important element that is going to require big faith. I’m telling you, nobody would believe or even guess close to what I’m believing for right now but it too will come to pass and I’ll get to testify of it with written proof! He’s a good good Father!